If you’re familiar with Hervé Tullet’s award-winning picture book Press Here, you can understand my skepticism as I sat down with my three-year-old daughter and one-year-old son. How exactly would Bay Area Children’s Theatre turn a book with no story line into an hour-long musical? The book guides young readers through a series of activities using yellow, red, and blue dots on the page, including pressing, tapping, tilting the book, and blowing the darkness away. I wasn’t the only one wondering. “Is this one of those audience participation shows? Then I’m sitting in the back,” Turner announces, striding up the stairs. This line is particularly ironic, since Quick, the actor, actually wrote this imaginative, wildly-entertaining musical for toddlers. Once the story line is activated, we meet the dots. 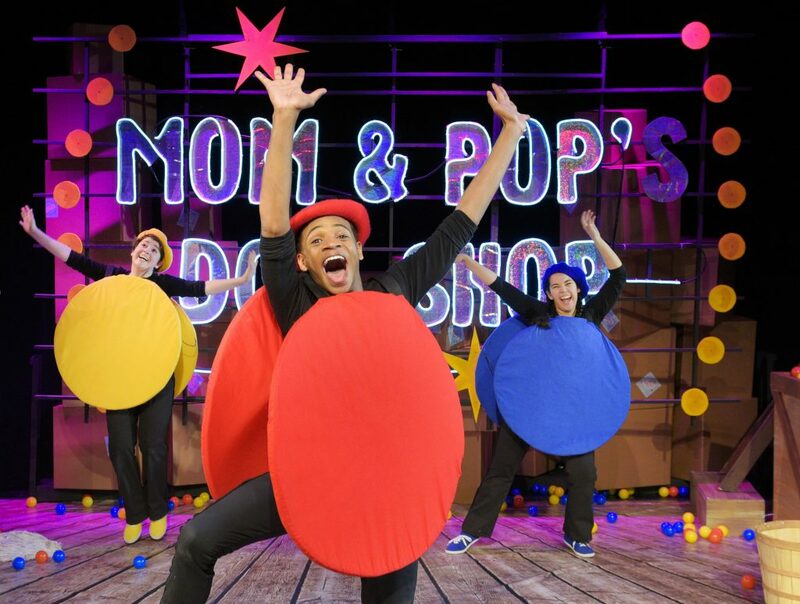 Yellow Dot (friendly, inviting Kailah Cayou), Blue Dot (sweet, except when she’s being mischievous Chelsea Wellott), and Red Dot (goofy, animated Kris Anthony Williams) are always together. They morph from barbershop trio, complete with straw boaters, to glowing orbs, to devious troublemakers with easy, addictive energy. Page and Turner find themselves preparing the Grand Opening of Mom & Pop’s Dot Shop. But… every time they get things perfect, the dots burst out of ball-pit boxes, causing a mess, and refuse to go back. “Uhhhh, no,” they say in unison. They run off stage, so Page and Turner chase them all over town before finally admitting defeat. Like the book, where readers are invited to do it all over again, Page and Turner decide to go back to Mom and Pop’s Dot Shop to take another stab at a perfect grand opening. 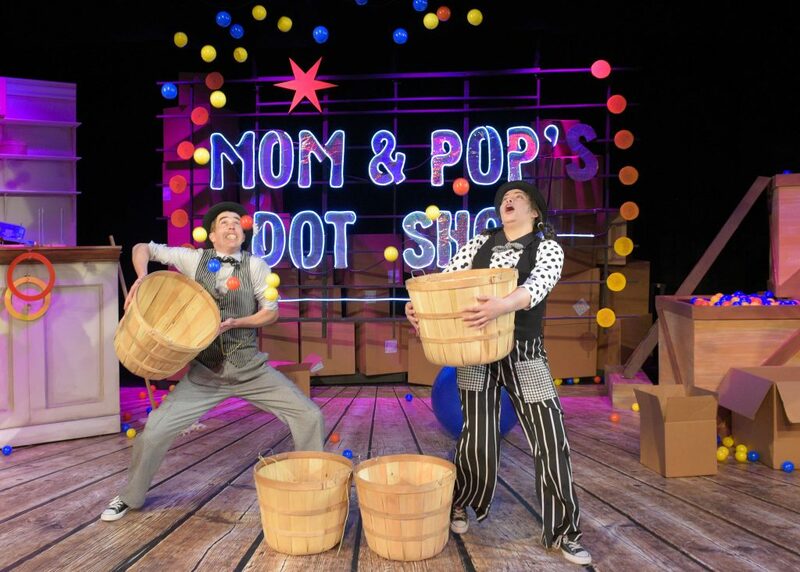 Each time is faster and wilder, and more kids race onstage to help clean up the ball mess. My daughter took this task very, very seriously. Playwright Andrew Quick, director Nina Meehan, and music/lyrics strongman Austin Zumbro combine into a creative powerhouse. The endearing, engaging story, the fantastic acting, the staging, props, and musicality thrill us all! A few scenes later, when Page and Turner need a little encouragement, the melody plays and the audience joins in with barely a prompt, singing the entire song, pitch perfectly. We feel that close to Page and Turner, part of their adventure. That’s a rare kind of magic for both kids and parents to find in a children’s production. 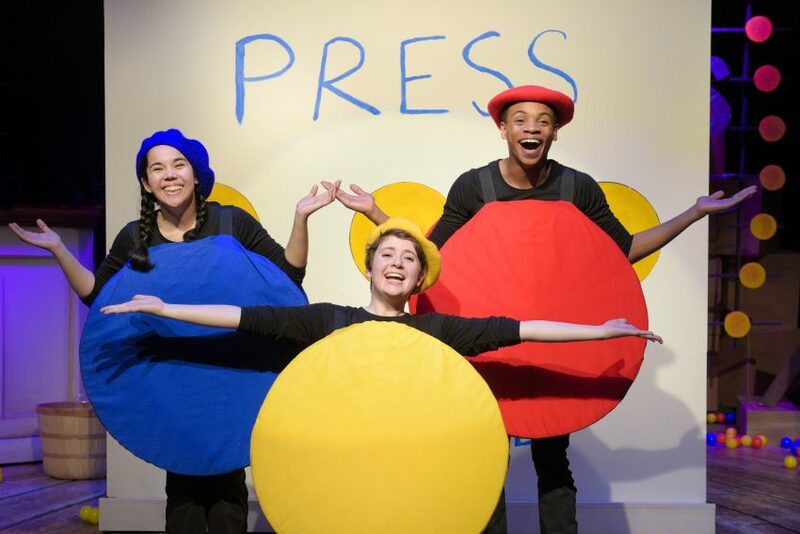 As a parent of two and veteran of BACT shows, we all heartily recommend the joyous, immersive “Press Here, the Musical,” a really fun show. Cast: Kailah Cayou, Rosemarie Kingfisher, Chelsea Wellott, Kris Anthony Williams, and Andrew P. Quick. and moves to San Francisco: June 8 – 30.